If lizards had pants the pants would have ants and the lizards would dance. Indeed they do! Part 1 of 2 in the fence lizard fire ant saga: Rapid evolution of fence lizards (Sceloporus undulatus) in response to selective pressures imposed by red imported fire ants (Solenopsis invicta). Dr. Travis R. Robbins is a postdoctoral research fellow in the Langkilde Lab who studies the ecological mechanisms that result in evolution. His interests range from the evolution of life histories in response to climate change to behavioral evolution in response to invasive species to the evolutionary significance of culture. 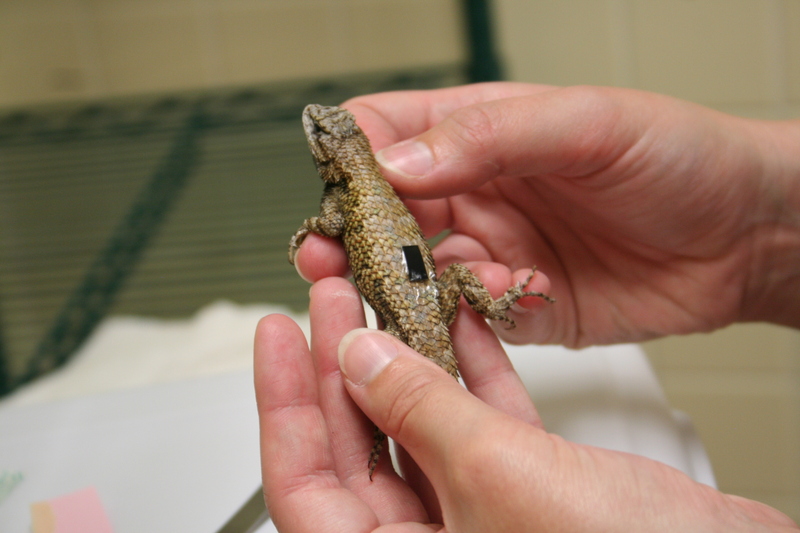 Most of his research, however, is on Sceloporus lizards (AKA Spiny lizards or Swifts), focusing on their genetic and plastic responses to environmental change and the underlying interactions between physiological (e.g. hormonal), behavioral (e.g. resource use and niche construction), and epigenetic mechanisms. 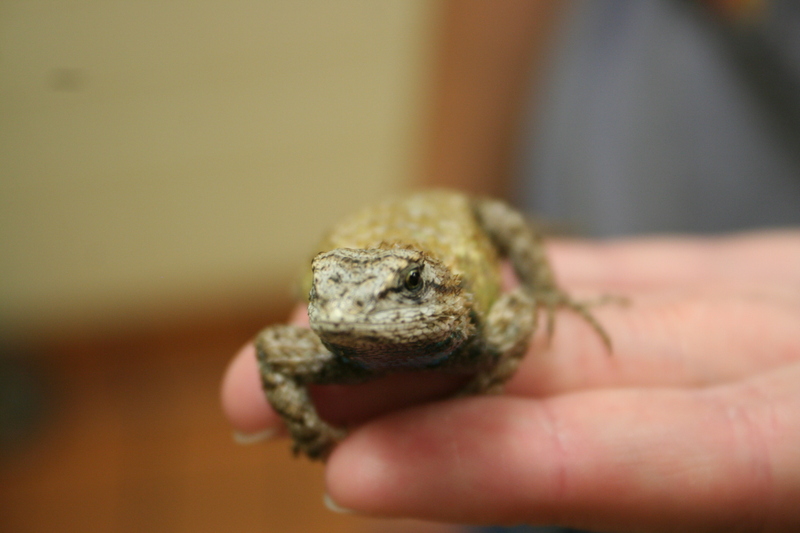 His research endeavors have brought him to Costa Rica, Panama, Mexico, the subtropics of Florida, and inside Biosphere 2 in the Arizona desert, but he is currently focusing on lizard evolution in the Southeastern US, which brings us to the current blog post. For the past three years I have been studying how fence lizards change their behavior and morphology after red imported fire ants invade the fence lizard habitat. This amazing study system that Dr. Tracy Langkilde fostered almost a decade ago reveals more exciting ecology with every research project! Tracy found an interesting trend across fence lizard populations that were invaded by fire ants at varying times in the past. 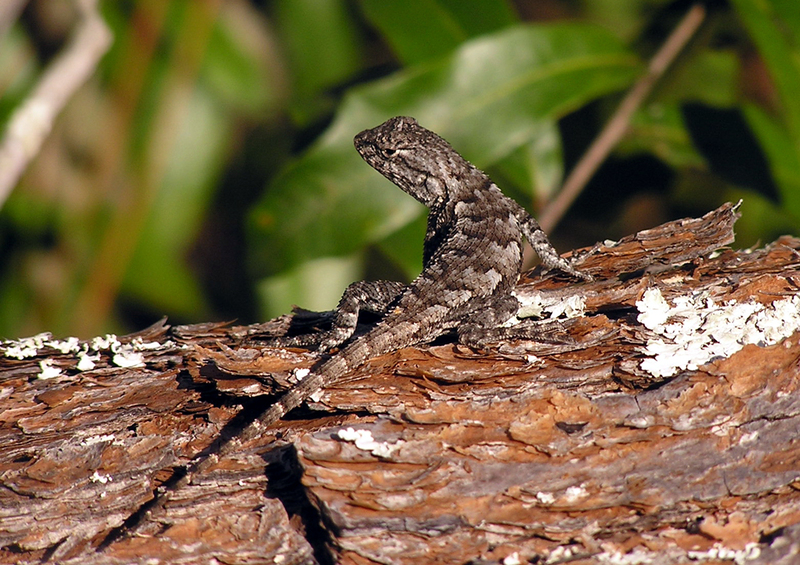 The longer fence lizard populations coexist with fire ants, the more fence lizards in each population begin to respond to agonistic encounters with fire ants. 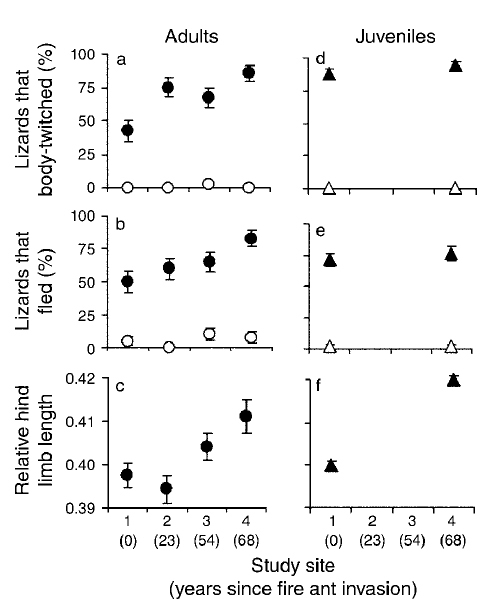 Change in use of (a, d) body twitch (solid symbols) and (b, e) flee (solid symbols) defensive behavior, and (c, f ) the relative hind limb length (shown as hind limb length/snout–vent length, SVL); of adult vs. juvenile fence lizards (Sceloporus undulatus) across sites with different histories of fire ant invasion. Open symbols represent behavior exhibited during control trials conducted in the absence of fire ants. Sexes are pooled for all panels. In all panels, values for adults represent mean 6 SE for 20 male and 20 female lizards from each site; values for juveniles represent mean 6 SE for 157 juveniles born to 16 females from Site 1, and 128 juveniles born to 18 females from Site 4. Usually this lizard species uses crypsis to avoid predation, so it is not prone to moving when something, that is usually harmless (i.e. not a fire ant), crawls over it. The lizards respond to fire ants, however, by dancing (twitching) and running away! And they evolve longer hind limbs so they can be really efficient at it! Most of our data collection has been about how fence lizards respond to fire ants when they find themselves being attacked on top of a fire ant mound. Fire ants are quite aggressive when they find someone knocking on their door. Unfortunately, especially for those of you that live with fire ants in your yard, fire ants spend a lot of time away from the mound ubiquitously foraging and roaming around the habitats they invade. Lizards surely encounter fire ants when they have the displeasure of accidentally knocking, but most of the time lizards are basking in the sun or foraging for food somewhere other than fire ant mounds. Thus, we wondered how often a fence lizard would encounter a fire ant away from a fire ant mound, so we conducted an experiment. We placed lizards 4 meters away from a fire ant mound (and fire ant mounds are approximately 10 meters apart where abundant, so this almost as far as you can get from one!) and observed them to measure how long it would take for a fire ant to find the lizard. 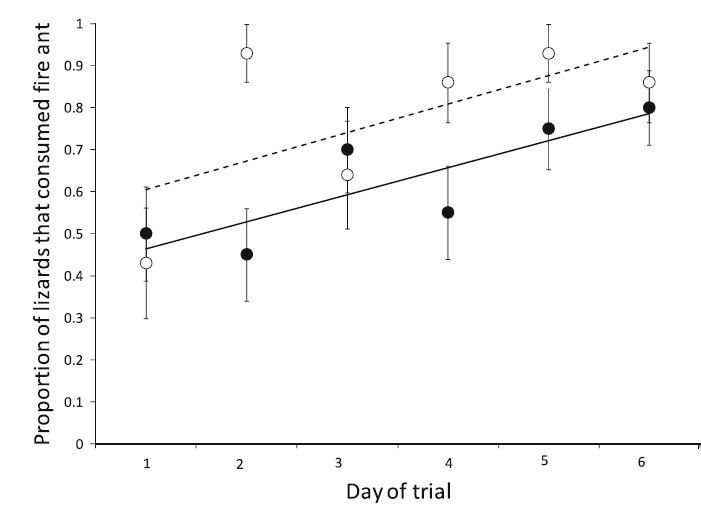 We also measured the behavioral response of the lizard and its effectiveness in avoiding an attack. 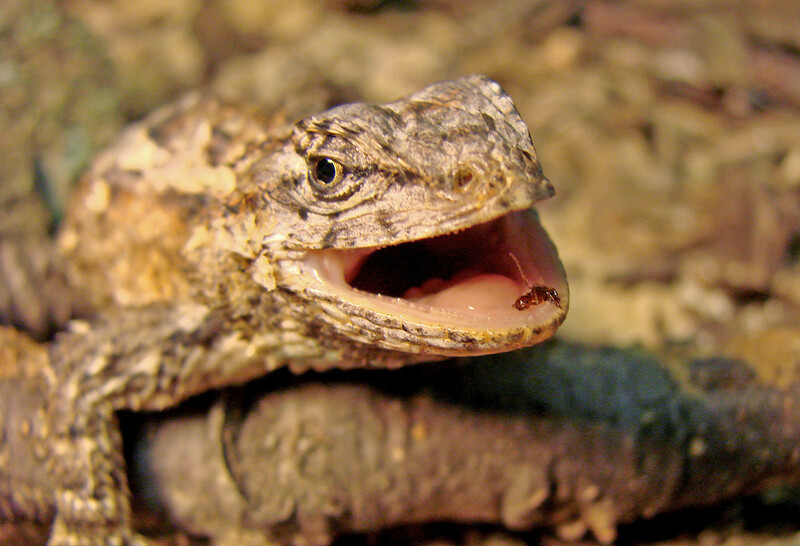 Fence lizards were found by fire ants within 105 seconds on average! We call the first fire ant to find a lizard a “scout”, and this single ant is not much of a threat to a fence lizard. However, that scout tells his buddies where to find the lizard, and a bunch of ants start heading toward the lizard to attack. We call this “recruitment”, and this higher number of ants attacking is potentially dangerous. It only takes 12 ants to immobilize an adult fence lizard in 60 seconds. But, don’t worry, we never let this happen during our trials. 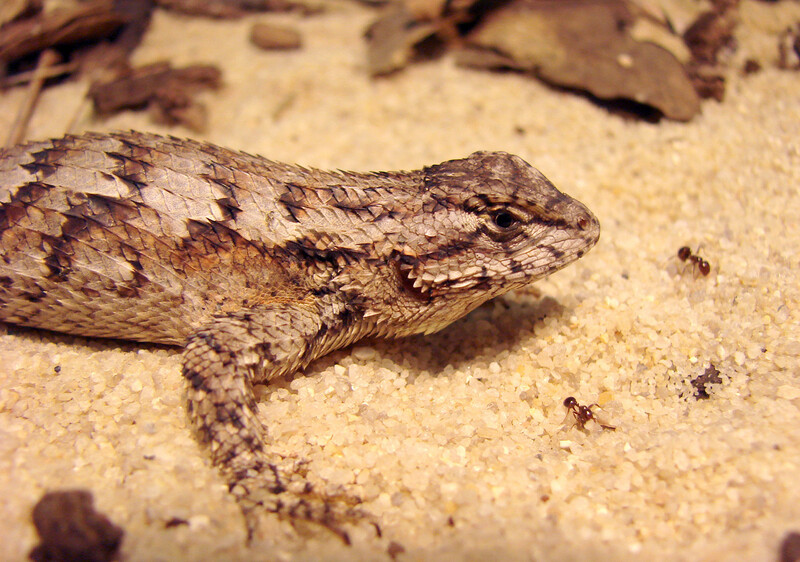 We hypothesized that fence lizards that grew up with fire ants would enact their dance and run technique (twitch and flee behavior) whereas naïve fence lizards would not. We also hypothesized that the dance and run would be effective at curtailing the recruitment. If fence lizards responded to the scout before the scout could bring back recruits, the recruits would come to an empty spot, and the lizard in its new spot would no longer be threatened by an attack. Our results suggested that this was indeed the case! Experienced lizards (those caught in the field at the invaded site) danced and ran when they encountered the scout. The proportion of field-caught (gray bars; n = 40 from each site) and laboratory-raised (white bars; n = 22 from each site) adult fence lizards from an invaded and uninvaded site that behaviorally responded to attack by red imported fire ants on a fire ant mound. Bars represent mean values ± 1 SE. 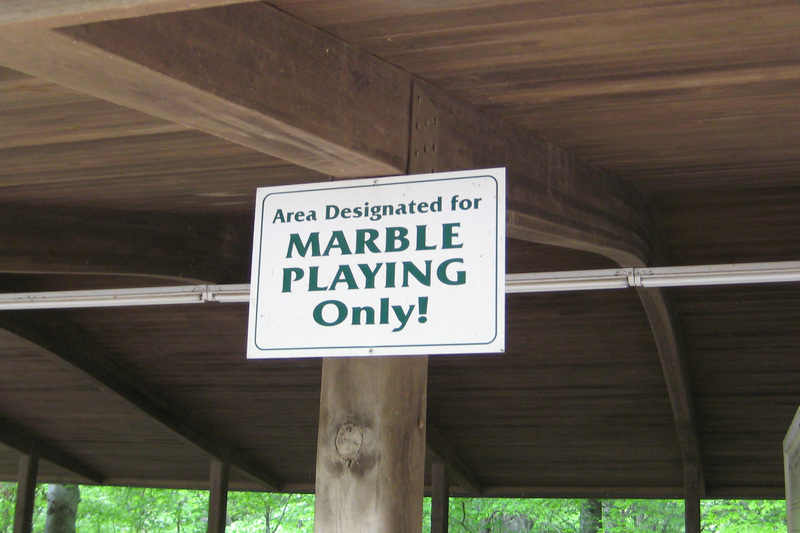 Different letters above the bars denote significantly different groups. 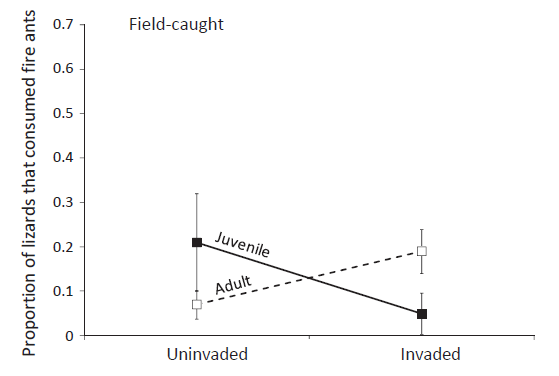 We found that experience with fire ants (lizards from the invaded site) affected only adults, however, because juvenile lizards from all populations were scaredy-cats, running away quickly. We also found that dancing and running in response to a scout was an effective strategy to escape the danger of an attack by recruits. The proportion of fence lizards that had red imported fire antsrecruit to attack them after being located by a fire ant scout, comparing responder (lizards that behaviorally responded to fire ants, n = 13) and nonresponder (lizards that did not respond to fire ants, n = 7) adults. Bars represent mean values 6 1 SE. Different letters above the bars denote significantly different groups. Our results suggest that when lizards grow up with fire ants they change their behavior in an adaptive way that likely increases their biological fitness by avoiding attacks by stinging fire ants (likely keeping them alive and in better moods). Overall, we have found that the longer a population has coexisted with fire ants, the more fence lizards in the population exhibit the changes, suggesting that these behaviors and morphologies are evolving to help fence lizards adapt to deal with the pesky, painful, and potentially portentous fire ants. We are currently examining whether or not these behaviors are inherited by comparing behaviors of mothers to their offspring once they become adults. Categories: Fun in the Field, Summer 2012 Field Trip, Summer 2013 Field Trip | Tags: Biosphere 2, Eastern fence lizard, ecology, Evolution, Fire ant, Florida, Red imported fire ant, Research, Sceloporus, Tracy Langkilde, Travis R. Robbins | Permalink. This past spring I applied for, and with the help of Dr. Langkilde received, a Penn State Discovery Summer Grant to conduct independent research. Initially, I planned to conduct two projects on similar systems. Unfortunately, only the second project (hence the title of this post) resulted in a successful field season. Which isn’t to say that the first project wasn’t valuable – it was perhaps the most valuable research experience I’ve had yet – but its value really lay in lessons learned rather than any publishable results! Before I explain the project, I want to first give a shout-out to Drs. Langkilde and Sean Graham. Dr. Langkilde managed to let me know that my initially proposed projects were all rather grandiose and unfeasible, while convincing me to keep on firing away with ideas. Eventually, I sent her an idea that we both agreed was novel, and more importantly, possible. Sean went out in the field with me during every day of sampling and made the project possible. This is all the more impressive because he is a post-doc researcher and I am just an undergraduate – which says much both about him and the atmosphere that Dr. Langkilde fosters in her lab. 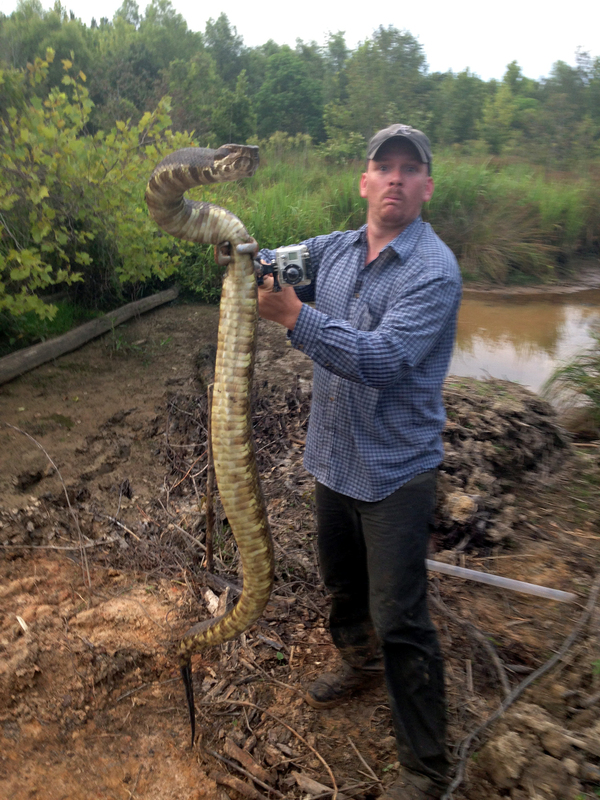 Dr. Sean Graham does his best to become an internet sensation by holding a cottonmouth safely out of striking range while using the standard forced perspective method so that it appears to be of monstrous size. However, this snake is actually only a little over 3 ft. long. The camera really does add a few pounds. I don’t want to delve into the specifics of my project idea in California, both because it will bring back the stinging memory of defeat (just joking!) and poison oak rashes so bad that they probably warranted hospital visits – both for Sean and I! Luckily, Sean and Dr. Langkilde had foreseen the fact that all might not go as planned with one of the projects – and so they had suggested that we conduct a second project as insurance. And so it was this “insurance policy” that became my last true hope for some publishable research during the summer break. 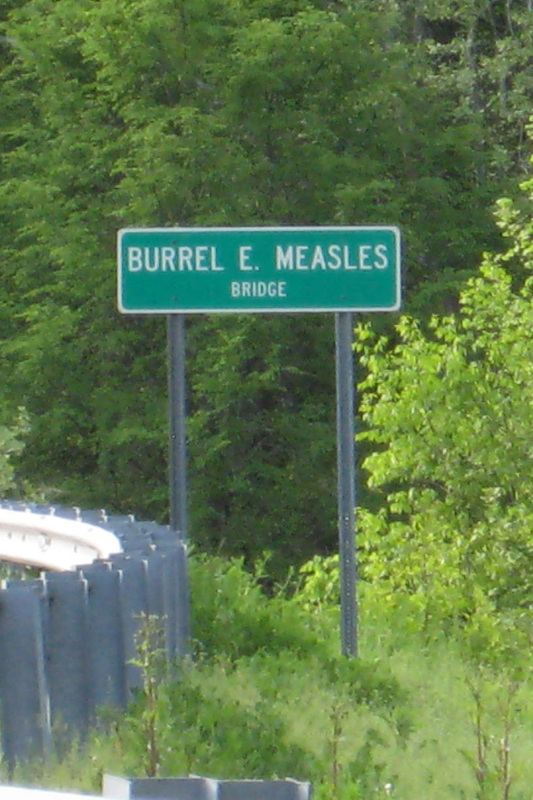 My project ran side by side with other work being conducted in Alabama by the Langkilde Lab, which allowed me to help out with other projects when I wasn’t out in the field with Sean collecting snake blood. Yes. 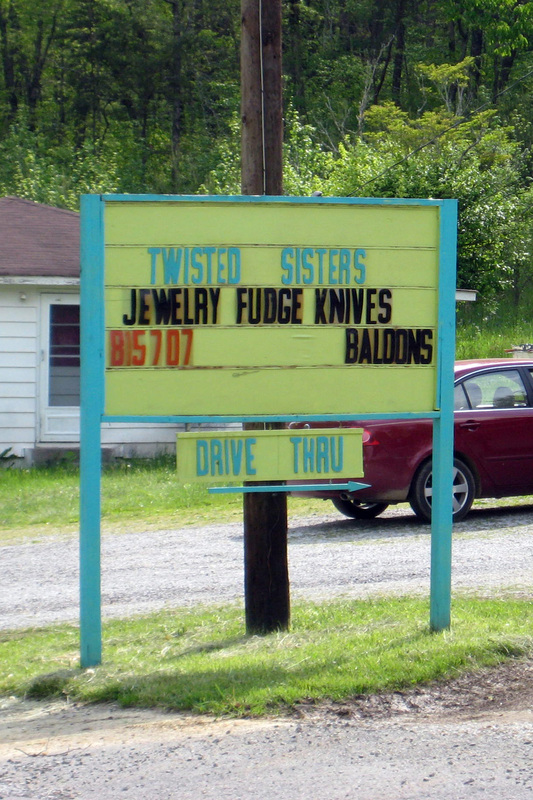 Snake blood, and no, this didn’t involve door-to-door salesmen selling cure-alls or primitive rituals by witch doctors. Sean and I investigated how the stress hormone (corticosterone) concentrations in Cottonmouths (Agkistrodon piscivorus) were related to their anti-predator behavior. Cottonmouths are large bodied, aquatic pit vipers native to the southeastern US. Most importantly, they are abundant. The snakes were honestly even more abundant than I had expected – even though we did have a period where we had trouble finding any, but more on that later. They are also famous for being aggressive, or, at least that is what the man on the street will say – the consensus among scientists and in peer-reviewed research is that they aren’t anything close to the bloodthirsty mankillers they are made out to be. Cottonmouths do, however, have an extensive suite of anti-predator behaviors. They vibrate their tails (even though they have no rattle), they hiss, they can strike, and they can open their mouth wide in what is called a ‘gape’ in order to convince a possible predator that they aren’t worth the trouble. Actually, this gaping behavior is what gives them their common name – the inside of their mouths has a white lining that is highly visible (especially in their often dark habitats). 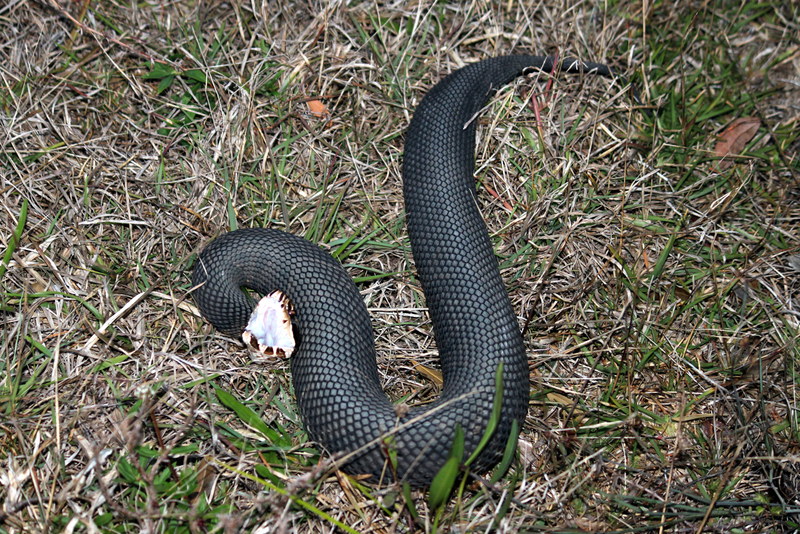 A Cottonmouth from the Everglades showing the display for which it is named. The fact that this species has so many different anti-predator behaviors means that I was able to formulate a point system that would rank each individual snake based on how “defensive” it was acting. The procedure was to approach the snake and stand in close (but safe) proximity to it for 15 seconds and then grasp it mid-body with a set of snake tongs for another 15 seconds – all the while taking note of every behavior that the snake exhibited. We would then use a snake tube to restrain the animal and take a blood sample. As I write this I am laughing out loud at how simple that last sentence makes the blood drawing seem. The problem, as you might imagine, is that often times (read: every time) the already defensive snake wants nothing more than to avoid slithering up a tight clear plastic tube so that we might get our blood sample safely. For obvious safety reasons, the entire tubing maneuver has to be completed using nothing but a set of snake tongs and a tremendous amount of patience – tubing is the safest way to handle venomous snakes – by far (both for the snakes and the researcher). It’s the industry standard technique. Using a pair of snake tongs, the snake is grasped firmly enough at the midbody to prevent the snake from escaping but not so tightly as to injure the animal. The tube is maneuvered such that it fits over the snake’s head, and ideally the snake will crawl up the tube such that its body is half inside and half outside the tube, with the snake’s posterior body portion and tail hanging out of the end. Swiftly and steadily, the snake is grasped at midbody at the exact point where it hangs out of the tube – with the hand holding the snake firmly grasping both the animal itself and the tube to prevent the snake from either moving further forward or backing out. Step #2 is sometimes easy, as the snake will cooperate and crawl up the tube as soon as it is able. Usually, though, it is not so easy. More often it would rather keep dodging and moving its head away. 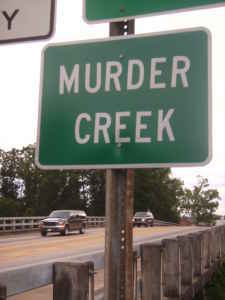 Even more often it would rather just strike the tube repeatedly. This process was further complicated by the fact that we were on a tight time schedule –we needed to obtain blood from the snake before its hormone levels had risen significantly (which takes only a few minutes). Did I mention the fact that we were unable to physically touch the snakes until they were in the tube? 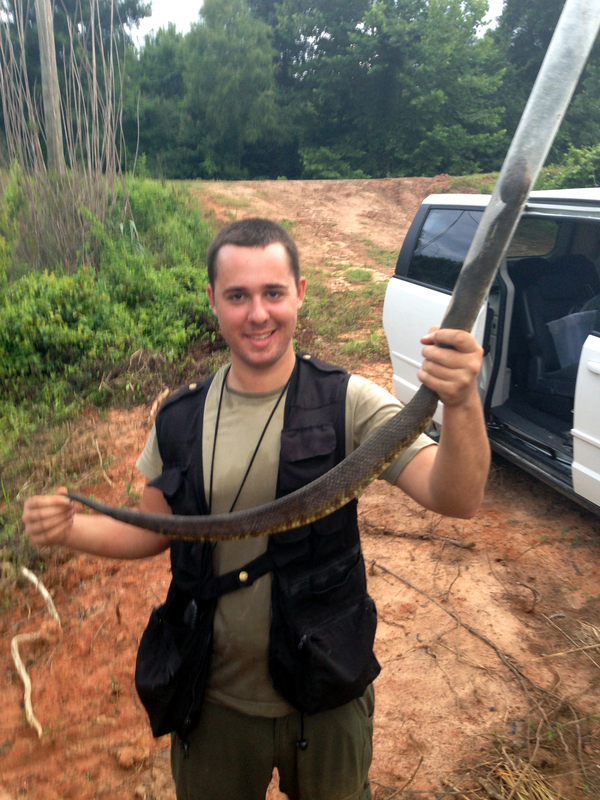 A safely and successfully tubed Cottonmouth on display after obtaining a blood sample. We went out during the day and at night searching for snakes, usually spending at least 4-5 hours at a stretch slogging through swamps in waist deep swamp water, and we managed to get to within about 5 snakes of our sample size when we hit a wall. No. More. Snakes. I can’t even remember how many times Sean and I ventured forth without finding even a single snake. It was as though cottonmouths had gone from being the most common snake in the Conecuh National Forest to almost nonexistent. A change in the weather may have been the culprit, but I wasn’t nearly as concerned with the source of the problem as with the prospect that I might not find enough snakes to complete the research. 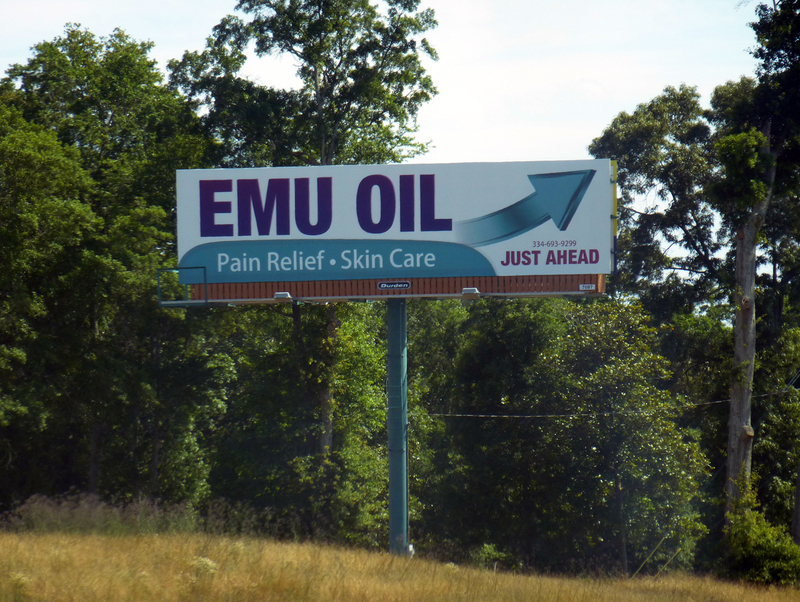 Luckily, we had a solution. Sean had a location that he knew would guarantee snakes en masse – unfortunately, it was too far away for just a day trip. 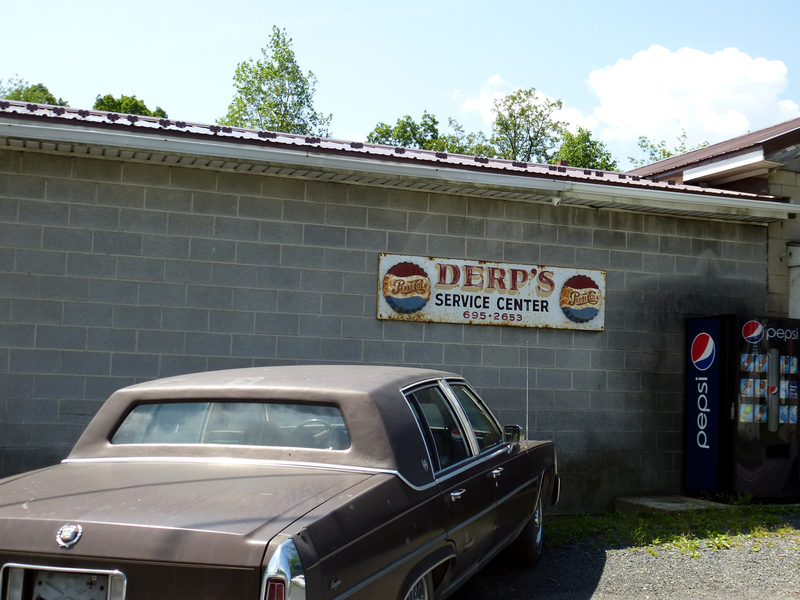 Our solution was to hit this magical spot on the way back to Pennsylvania on our very last day. I can’t tell you how nervous I was when we went out that final night. We didn’t have enough snakes. More importantly, we really needed to find a specific subset of snakes, adult males, which are significantly more difficult to locate than adult females or juveniles. We absolutely had to leave for Penn State the next morning, making this the absolute last possible time to get enough snakes to complete the project. The previous four days hadn’t yielded even a single snake. Just for dramatic effect, there was an absolutely MASSIVE electrical storm just prior to our sojourn, shaking the ground and lighting up the sky like a child repeatedly turning the lights on and off inside an otherwise pitch black room. 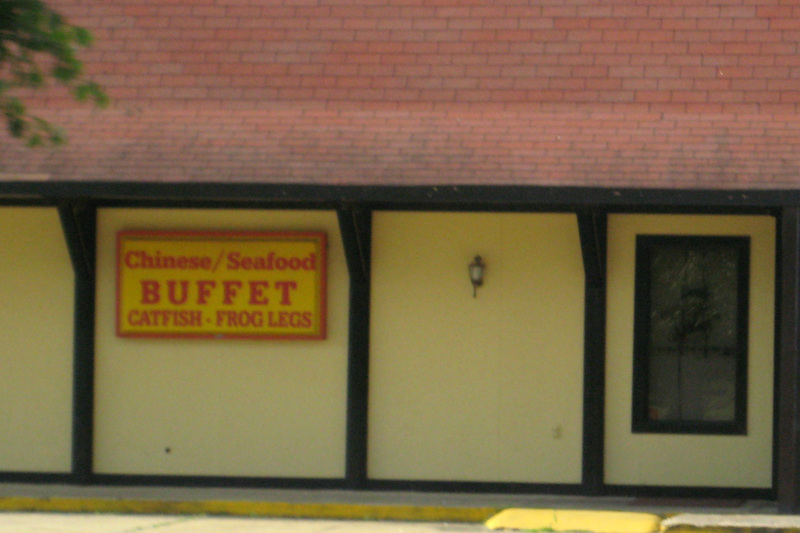 Well, that night could have shared a title with this post: Redemption in the Deep South. After working from 8:00 pm to 2:00 am, slogging through waist deep (read: sometimes neck deep) blackwater while exhausting our drinkable water, getting lost, and receiving (conservatively, of course) 1,000,000 mosquito bites, we found our 5 snakes. Three of the five were adult males. Our goals were complete. Victory. I am still in the process of inputting data and running samples, so I can’t yet tell you how stress hormone levels in cottonmouths relate to their behavior. What I can tell you is that working through the trials and tribulations of this summer’s research has made me a better scientist by far. I have many to thank for making this experience possible, but my highest gratitude extends to Tracy Langkilde, Sean Graham, and the cottonmouths of south Alabama. Thanks guys. Categories: Summer 2013 Field Trip, Undergraduate Research | Tags: Agkistrodon, Alabama, Conecuh National Forest, cort, corticosterone, Cottonmouth, defensive behavior, Langkilde, Snake | Permalink. No, it’s not the name of a cool new band you haven’t discovered yet; the Hanging-thieves are a genus (Diogmites) of robber flies that is known for hanging by one or two legs from a perch site while consuming their prey. Robber flies (family Asilidae) are also known as assassin flies, because they catch other bugs while on the wing and eat them with their piercing mouthparts. 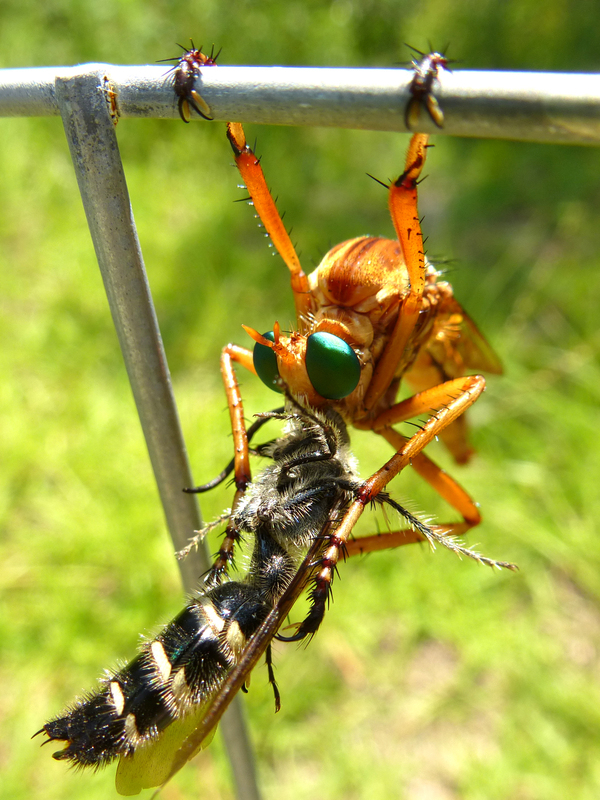 In general, robber flies are considered to be beneficial, as they eat many pest insects. A hanging-thief chows down on a freshly caught wasp . I was lucky enough to stumble upon a Hanging-thief (it looks like Diogmites salutans) as it was engrossed in eating a wasp. The robber fly was perched on one of my AED’s (Armadillo Excluder Devices), small wire cages that I set up to protect my fake lizard nests from predation by wily armadillos (that story another time…). The fly had already paralyzed its prey with venom, which also contains enzymes which liquefy the prey’s innards (as in spiders). As I watched, the robber fly carefully manipulated the wasp, turning its body over and around, and inserting its proboscis into likely sites, as if its prey were some sort of delicious juice box. In the video below, you can see the mouthparts of the fly working to slurp up its presumably delicious meal. My favorite part of seeing this robberfly was observing its moustache, or mystax, which is so tough that it may help protect the fly from injury when it is subduing struggling prey. 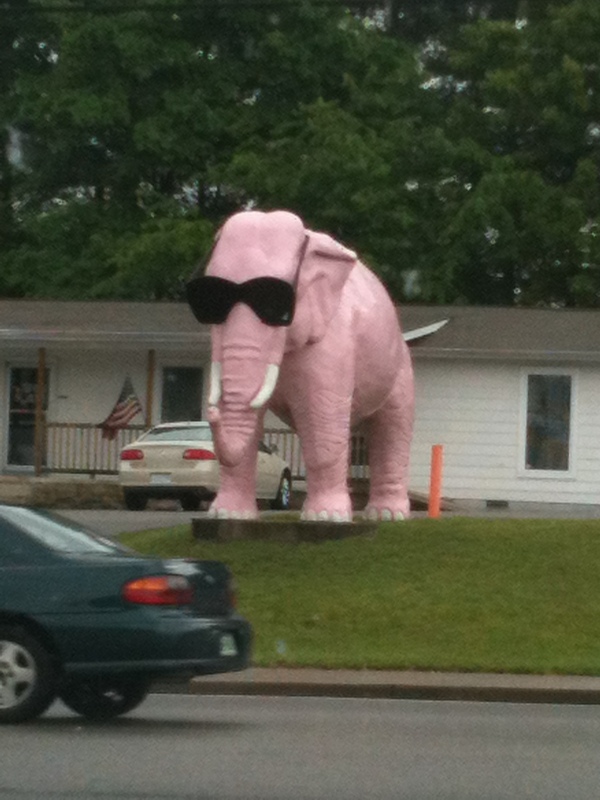 The mystax is among the most fearsome of moustaches in the animal kingdom. Categories: Summer 2013 Field Trip | Tags: Arthropoda, Asilidae, Biology, Diomites, Diptera, Predation, robber fly, wasp | Permalink. As Gail mentioned in a previous post, one avenue of our lab’s research involves looking at the behavioral responses of fence lizards to fire ants. These behaviors include leg twitches, tail writhing, full body jumps and shakes, head wipes, and eating attacking fire ants. 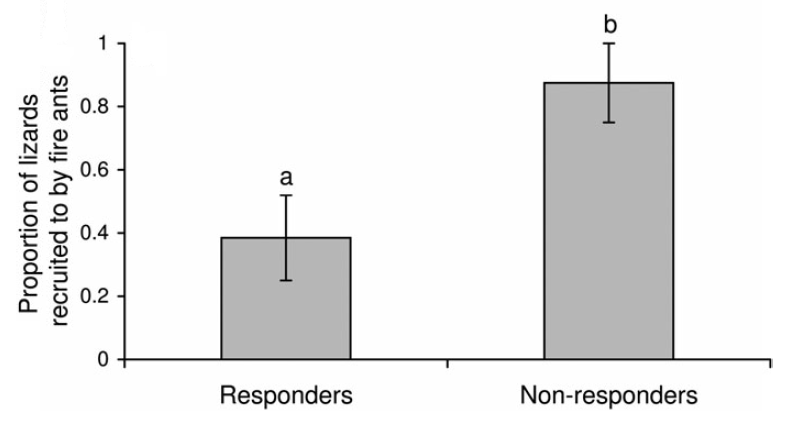 We also are currently investigating how these responses vary with context; to whit, we want to know whether fence lizards respond differently to fire ants based on whether those ants are defending their mound or if the ants are out foraging for food. Fire ants, like many ant species, will construct foraging trails to a food source once it is discovered (as seen below). 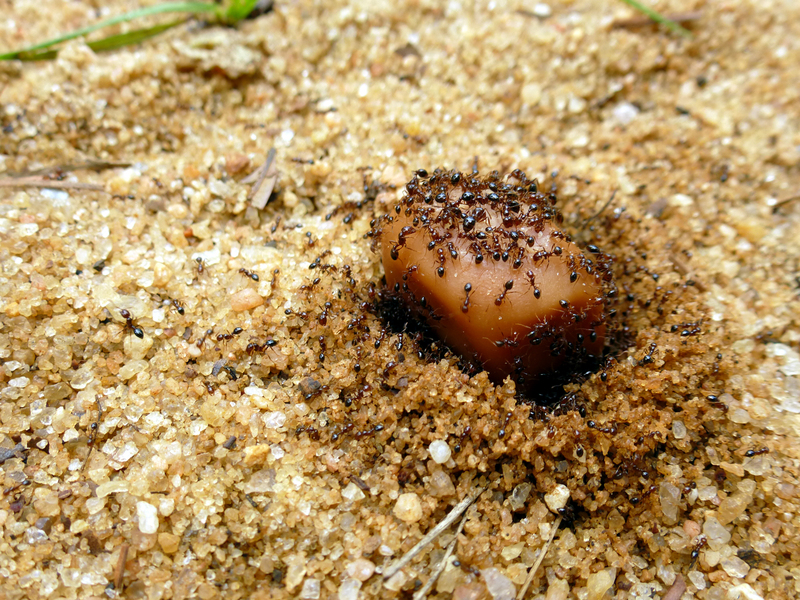 Scout ants, upon encountering a food item, will lay down a pheromone trail that other ants will follow to allow them to feed and return with sustenance to the mound. To effectively study how lizards respond to ants in “foraging mode,” we need to generate lots of foraging trails of ants. And with ants, as with college students, if you want them to show up, you need to bribe them with food. Previously, we’ve used both peanut butter (creamy…fire ants hate chunks) and hot dogs as fire ant bait. Fire ants chow down on a delectable bit of American cuisine. Fire ants, like humans, are attracted to foods with lots of fat and protein (especially when they are brooding). This week, however, I stumbled upon an even more tempting proposition for the ants: good old bacon. At breakfast, I tucked a half-finished piece of bacon into my pocket, and scattered several chunks of it in the sandy area that we use for our foraging ant trials. Within 15 minutes, the bacon was swarming with fire ants, attracted to the high level of deliciousness of the baits. A visit from a hymenopteran in a yellow jacket brought a touch of class to the party (see below). While we won’t be using bacon everyday to seed our foraging trails, we have definitively learned that fire ants share the human propensity for unhealthy but scrumptious foods. Categories: Fun in the Field, Just For Fun, Summer 2013 Field Trip | Tags: ants, fire ants, hotdog | Permalink.